Syncretic Press is an independent Spanish publisher in the U.S.. 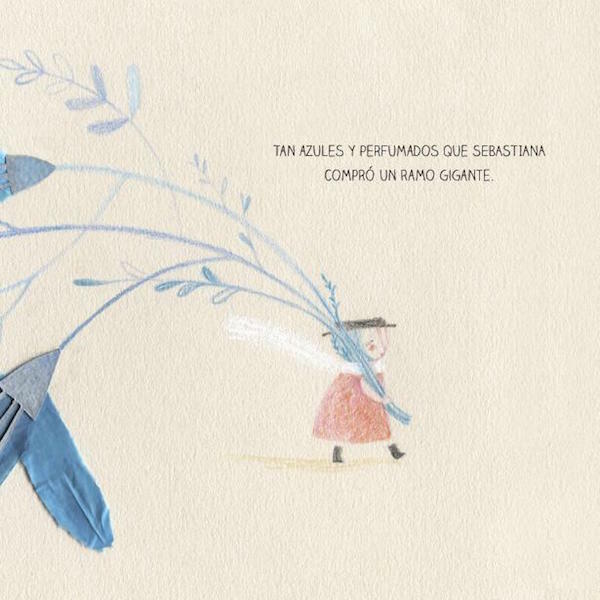 They are partnering with authors and illustrators around the world to publish beautiful Spanish-language children’s books. Check out our Spanish Books for Kids Resource Page for reviews and activities for favorite books. At Spanish Playground, we are thrilled to see the titles Syncretic Press has available. This new Spanish publisher in the U.S. has sought out award-winning writers and artists. 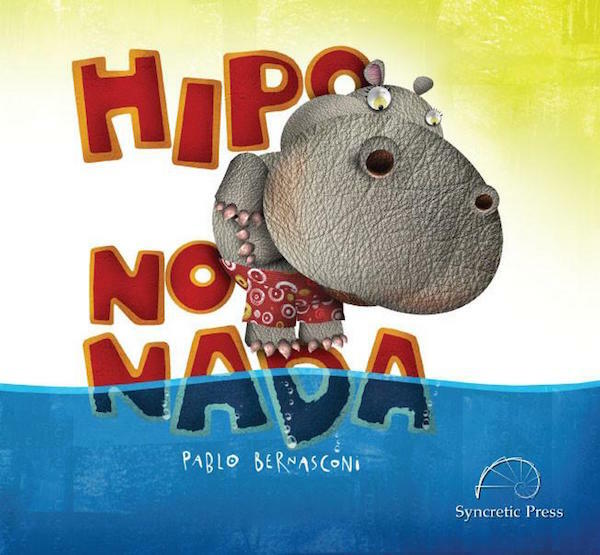 They place a special emphasis on picture books by authors from Spanish-speaking countries. They have chosen their titles very carefully, selecting enchanting books you can use with Spanish language learners or native speakers. I am so impressed with the titles they have chosen for their catalog. It is a wonderful selection! I am fortunate to have the opportunity to work with many publishers and attend international book fairs in Mexico and Peru. Although quality children’s books from different countries have much in common, children’s books by authors from Latin America are also unique and beautiful. They offer readers a very different experience than a translation or a book written in Spanish by an author from the United States. Through their content, word choice, illustration and typography, picture books from Latin America offer a rich combination of language and culture. For native speakers and Spanish learners, it is best to have access to literature from many places and cultures. As a new Spanish publisher in the U.S., Syncretic Press is making fabulous titles available to young readers. I want to highlight a few books that have captured my heart, and more important, the hearts of my students. 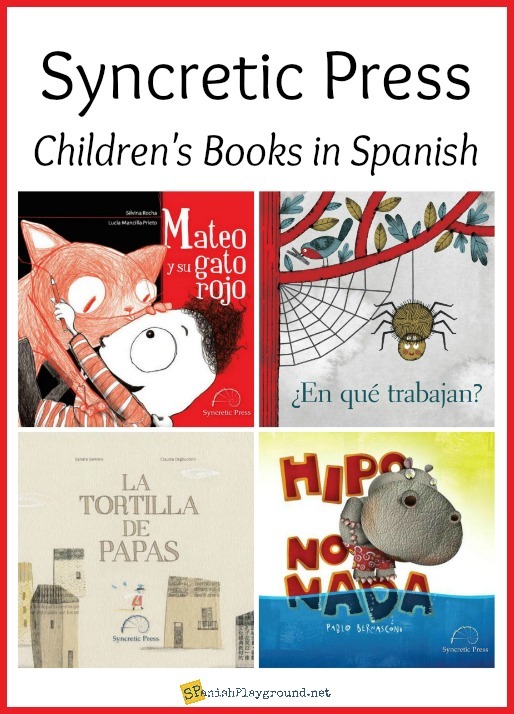 Be sure to see our book list of more children’s books in Spanish and read our tip for finding Spanish-language books for kids. You will want to explore the range of children’s books from this new Spanish publisher in the U.S.. It’s worth mentioning that Syncretic Press shows several interior spreads of each book. This makes it much easier to find the right book for young Spanish readers! Favorite Titles from New Spanish Publisher in The U.S.
La tortilla de papas is such a beautiful book! 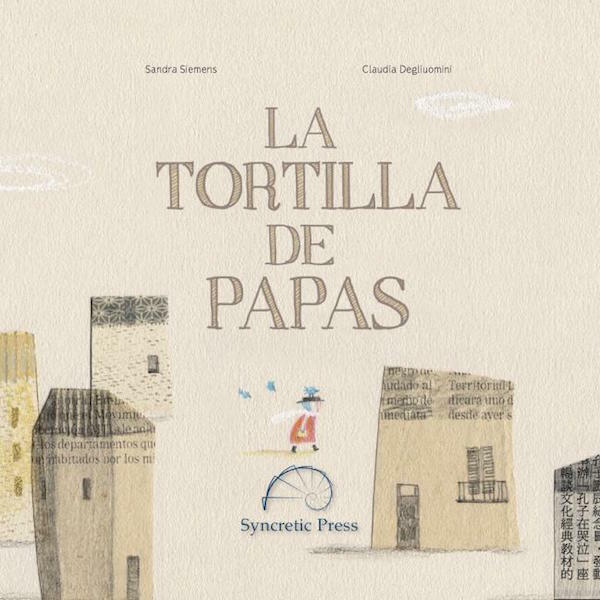 A simple story and familiar vocabulary move children through gorgeous illustrations as Sebastiana shops for a key ingredient to make a tortilla de papas. The story is circular, as Sebastiana forgets to buy what she needs and heads out again and again. It is also open-ended, encouraging readers to anticipate how the story continues and whether it ever really ends. Originally published in Argentina, La tortilla de papas is an invitation to explore South American culture. From the delicious dish in the title and the foods in the market to the llamas that watch Sebastiana as she walks through town, the setting is integral to the story. This is also a wonderful book for talking about descriptive language. Sebastiana repeatedly forgets to buy eggs because she is taken with the beauty of what she sees. For example, the tomatoes “eran tan rojos y tan redondos.” The olives are “pequeñas y lustrosas como piedritas de río.” The oranges are “dulces, jugosas, grandes como soles” and so on. Sebastiana’s forgetfulness functions to fill her day with happiness. Her appreciation for the beauty around her and the pleasure she takes in each purchase create an uplifting, joyful story. 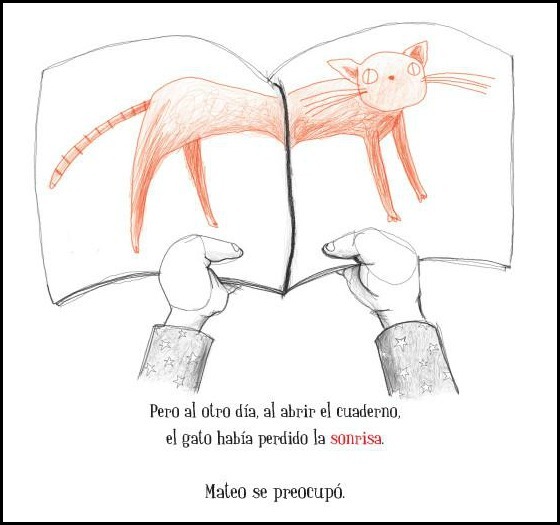 Mateo y su gato rojo is a wonderful book for all children, and especially for children who love to draw. I wish I had had this book when my oldest was a child. In the story, Mateo draws a cat. Then, feeling a responsibility to his creation, he draws it food, a place to sleep, a friend. As the story continues, Mateo discovers what all artists learn, that a drawing or a story takes on a life of it’s own. This is a captivating book, as readers identify with Mateo’s concern for his creations. The familiar language and basic sentence structure make it accessible to Spanish learners, allowing them think about the ideas. This is a story children will treasure! 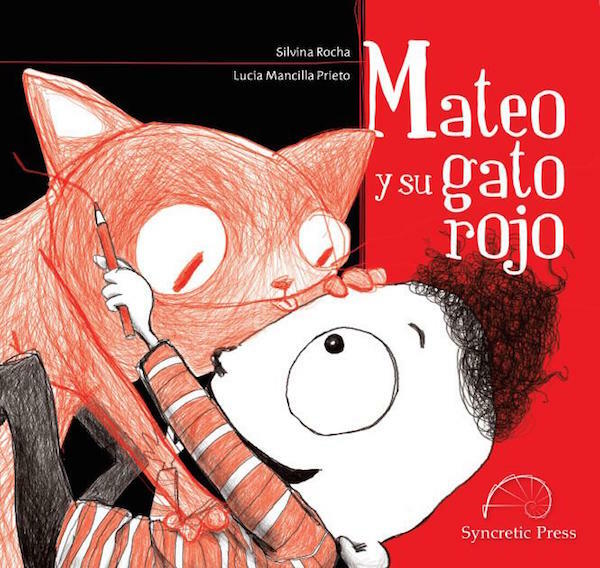 Syncretic Press has a set of activity sheets for Mateo y su gato rojo. The activities include reading comprehension and vocabulary questions as well as descriptive language/part of speech practice with nouns and adjectives. Fittingly for a story about drawing, the activity sheets encourage children to illustrate their answers. Hipo no nada is a tender story built on a simple pattern. 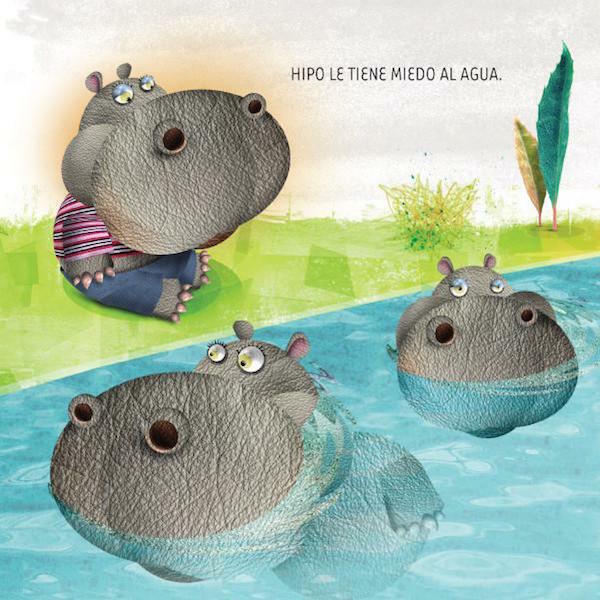 It follows Hipo, who is afraid of water, as he tries activities that come naturally to his animal friends. Of course, he can’t jump like a rabbit or perch in a tree like a bird. However, each time, the animals exclaim that it doesn’t matter, because hippos can swim. This encouraging story about recognizing your talents features high-frequency structures and accessible vocabulary. My students loved Hipo! As you can tell, we are very happy to have this beautiful selection of books available. As a Spanish publisher in the U.S., Syncretic Press has titles for language learners and native speakers. They are a fabulous addition to the publishing community and we look forward to reading many more of their titles!